The other day I was brainstorming ways to make the Pythagorean Theorem more accurate. Football has a unique scoring system. Touchdowns are worth six points, field goals three, and safeties two. In addition, after touchdowns, teams can attempt to kick for one point or cross the goal again for two additional points. By contrast, in baseball and hockey, scoring events, runs and goals, are worth the same amount each time. Basketball is a little more complex, with free throws worth one point, field goals worth two points, and shots behind a certain arc worth three points. Basketball also has more scoring events than baseball and hockey. With that in mind, I wanted to look for a scoring event in football that is analogous to a run in baseball or a goal in hockey. Its actually pretty easy to find. Offensive touchdowns. Teams score offensive touchdowns at about the same ratio that teams score runs in baseball and goals in hockey. In addition, offensive touchdowns help us get rid of some of the statistical 'noise' generated during a football game. Field goals (both for and against) are heavily dependent on one individual player in a sport where team play matters most of all. Special teams and defensive touchdowns, while they play a huge role in the winner of an individual game, do not have a great deal of predictability going forward. Notice I said 'some' of the noise, but certainly not all. Defensive and special team ability can make offensive touchdowns easier by setting up the offense with a short field. Still, ignoring all scoring plays except for offensive touchdowns should give us a good idea about a team's strength. We'll call the resulting record a team's Adjusted Pythagorean Record (or APR). I used 2.37 as the exponent because research has shown it makes the resulting ratio a more accurate predictor. Now lets take a look at the Adjusted Pythagorean Theorem in action. In 2007, Oklahoma State enjoyed a rather middling season in the Big 12. There were some highlights of course. They beat Nebraska in Lincoln for the first time since 1960, upended a Kansas State team ranked in the top-25 at the time, and gave Texas a run for their money in Stillwater. They were also trounced by Oklahoma and beaten by Kansas in Stillwater for the first time since 1995. All in all, the Cowboys went 4-4 in the Big 12. How did they do according to the Adjusted Pythagorean Theorem? Well, in their eight conference games, they scored 35 offensive touchdowns. Not bad. That tied for the third highest number in the conference. Unfortunately, teams also scored 35 touchdowns against their defense (tenth in the conference). All in all, the Cowboys record based on their offensive touchdowns scored and offensive touchdowns allowed was 4-4. And lo and behold, that was their record. Of course, this is just one cherry picked example. the Adjusted Pythagorean Theorem rarely hits the nail directly on the head. However, it does usually correctly predict a team's record within one game of their actual record. Since 2007, the Adjusted Pythagorean Theorem predicted each team's conference record within one game for nearly two-thirds (386 of 582 team seasons or 66.3%) of all teams. So if the Adjusted Pythagorean Theorem does a pretty good job of predicting a teams record based solely on how many offensive touchdowns they scored and allowed, what happened to those teams that significantly over or underperformed their APR? I thought you might ask that. To answer that question, I looked at all teams from 2007-2010 with a conference record at least one and a half games different (either better or worse) than their record as predicted by the Adjusted Pythagorean Theorem. I then looked at how they did in conference play the following season. And now I will share with you the results. As with the previous two blog entries, I have separated BCS and non-BCS conference teams to see if there appear to be any differences. First off, the BCS conference teams that exceeded their APR. 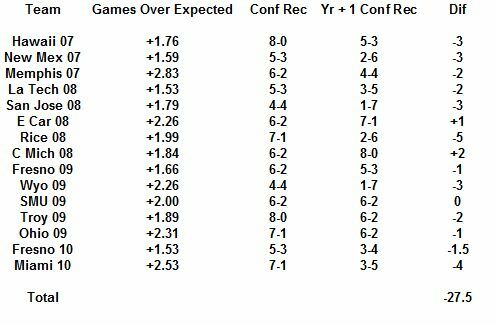 Of the 15 teams that exceeded their APR in conference, 13 declined the following season. One team stayed the same, and only Oregon State circa 2007 improved. Many of the declines were significant. 11 of the 15 teams declined by at least two games in conference play, and some (Texas, Auburn, and Cincinnati) totally fell off a cliff. On average, these teams declined by 2.27 games in conference play the following season. 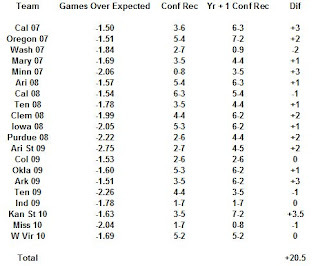 Now the BCS conference teams that underperformed their APR. 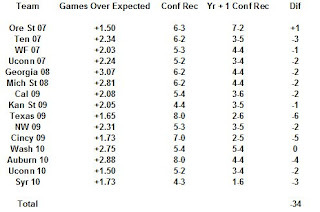 Of the 20 teams that underperformed their APR in conference, 13 improved the following season. Three stayed the same and four finished with worse conference records. Overall, the teams improved by just a shade over one game (1.025) in conference play the following season. Now the non-BCS conference teams that exceeded their APR. 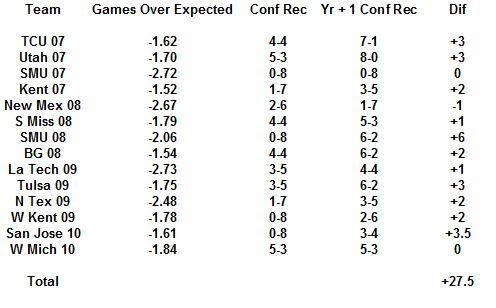 Of the 15 teams that exceeded their APR in conference, 12 declined the following season. One team stayed the same and two improved. Overall, these teams decline by 1.8 games in conference play the following season. 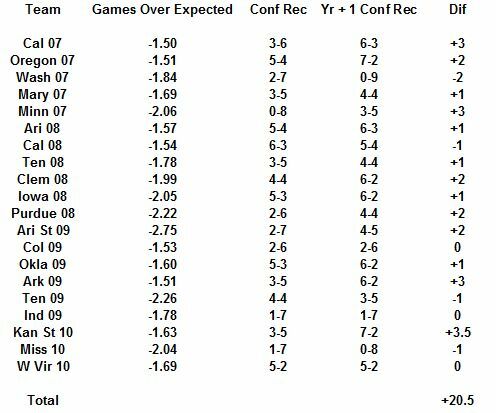 Now the non-BCS conference teams that underperformed their APR. 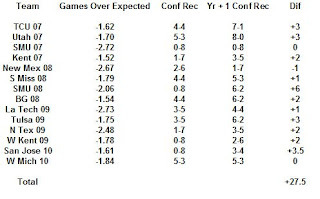 Of the 14 teams that underperformed their APR in conference, 11 improved the following season. Two stayed the same and only one team (New Mexico circa 2008) declined. Overall, the teams improved by nearly two games (1.964) in conference play the following season. So now the next question on your mind should be: Who under and over-performed their APR in 2011? Eight BCS conference teams exceeded their APR in conference play. In the ACC, Virginia allowed more offensive touchdowns than they scored, yet managed a 5-3 ACC record. Mike London may find it hard to take the Cavaliers to back-to-back bowl games for the first time since Al Groh did it in 2004 and 2005. In the SEC, Auburn allowed 10 more offensive touchdowns (27) than they scored (17), yet still somehow managed to win half their league games! With Texas A&M joining the SEC West and Clemson on the non-conference schedule, the Tigers could miss the postseason altogether in 2012. In the Big 12, Kansas State allowed more offensive touchdowns than they scored yet managed a 7-2 conference record, finishing all alone in second place. A reversal of fortune is almost certainly in store in 2012. The Big 10 had three teams drastically exceed their APR. Penn State won six Big 10 games and was in contention until the final weekend of the regular season. However, the Lions allowed more offensive touchdowns than they scored and will be breaking in a new coach for the first time since 1965. Michigan State won seven conference games and nearly earned their first Rose Bowl bid since 1987. However, based on APR, the Spartans should have only won a shade over five league games. Nebraska underachieved all season and actually allowed more offensive touchdowns than they scored. That should make Michigan the favorite in the Legends Division in 2012. UCLA 'won' their division in the Pac-12 despite allowing more offensive touchdowns than they scored. Jim Mora may be in for a long season during his first year at the helm. And finally, Louisville was a surprise co-Big East champ in Charlie Strong's second season. However, the Cardinals allowed more offensive touchdowns than they scored (sensing a theme? ), so even with West Virginia out of the picture, a BCS bid is still likely a pipe dream. 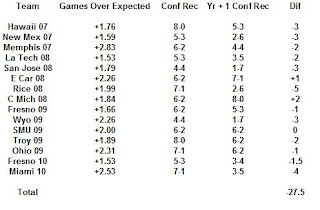 Six BCS conference teams significantly underperformed their APR in conference play. Miami scored more offensive touchdowns than they allowed, yet finished with a losing record in the ACC. Perhaps Al Golden can coax a solid showing out of this under-performing group. North Carolina also scored more touchdowns than they allowed in league play, yet finished with a losing record. Larry Fedora steps into a pretty good situation assuming the NCAA investigation has run its course. In the SEC, Vanderbilt showed some moxie and was much better than their 2-6 SEC record. Could James Franklin take then to consecutive bowls for the first time ever? Texas A&M was expected to be a contender during their last run through the Big 12. A plethora of second-half collapses caused the Aggies to finish 4-5 despite scoring seven more touchdowns than they allowed. They move to an insanely tough division and must contend with Alabama, Arkansas, and LSU, but could position themselves in the middle of the division. South Florida lost seven of eight after a 4-0 start and finished tied for last in the Big East. No one would be shocked if the Bulls went from worst to first. Syracuse also drastically underperformed their expected Big East record. Syracuse probably won't be winning the league in 2012, but a return to the postseason is likely. Five non-BCS conference teams exceed their APR in conference play. Marshall finished 5-3 in Conference USA despite allowing more offensive touchdowns than they scored. The Herd will find returning to the postseason quite challenging in 2012. UAB won three games in Conference USA despite allowing twice as many offensive touchdowns as they scored (those teams typically only win about one game). Despite the relative good fortune, the coach was still canned. New coach Garrick McGee has his work cut out for him. Northern Illinois won the MAC Championship despite posting the profile of a solid, but hardly elite MAC team. Dave Doeren deserves credit for leading the Huskies to the summit in his first season, but a repeat is highly unlikely. Arkansas State finished unbeaten in the Sun Belt and got coach Hugh Freeze a job with Ole Miss. New coach Gus Malzahn may yet make the Redwolves into a Boise State-like power, but there is likely to be some regression in his first season. And speaking of Sun Belt powers, Louisiana-Lafayette also significantly exceeded their expected Sun Belt record. A second straight bowl appearance would likely have coach Mark Hudspeth in line for some big time jobs. 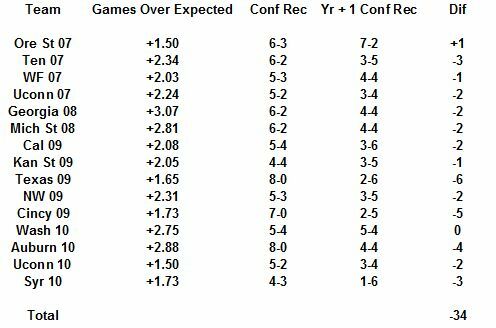 Four non-BCS conference teams significantly underperformed relative to their APR in conference play. UCF followed up their top-25 final ranking in 2010 with a losing season in 2011. They'll be back at or near the top of the league in 2012. Miami of Ohio followed up their MAC Championship in 2010 with a losing season in 2011. With Temple gone to the Big East in 2012, the MAC East is wide open. Air Force scored more offensive touchdowns than they allowed, yet finished with a losing record in the Mountain West. The Falcons could be poised to take flight in 2012. And finally, Louisiana-Monroe scored more offensive touchdowns than they allowed in the Sun Belt, but finished just 3-5 in the league. With some breaks, they could overtake their in-state brethren and get to a bowl.